Ottawa, Ontario - Contentious clauses have been removed from the proposed Lansdowne redevelopment agreement after concerns were raised that the Ottawa Sports and Entertainment Group would have a monopoly over stadiums and arenas during the next 30 years, according to the Ottawa Citizen. 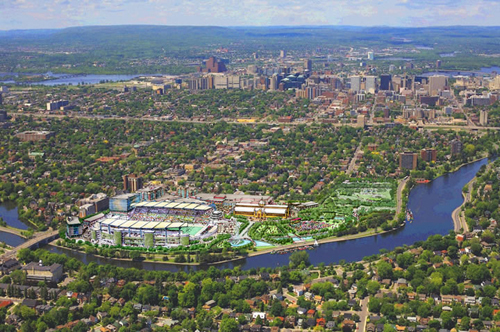 The move led to the approval this week of redevelopment plans for Lansdowne Park. Although council voted to proceed with the proposal to redevelop Lansdowne with Ottawa Sports, the plan to refurbish Frank Clair Stadium, build 340,000 square feet of commercial space and a publicly funded park, is not a done deal, the newspaper said. "It's a very important step and I'm very excited for the residents of Ottawa and the members of council," Roger Greenberg, an OSEG partner, told the newspaper. But he added there's "a lot of work between now and when the first kick-off takes place in a couple of years from now." As part of its vote, the city council directed city staff to negotiate a number of dates that the city can book Lansdowne Park, including Frank Clair stadium, at discounted rates for "special sports and cultural events that are of community interest and that couldn't otherwise afford" market rate. Officials scrambled to negotiate new terms after some council members and Senators Sports and Entertainment president Cyril Leeder said the clauses tied the city's hands and unfairly benefitted OSEG. One clause wouldn't have allowed the city to fund a new stadium of more than 5,000 seats for 30 years. Montreal, Quebec - The Montreal Gazette says Ottawa is on the top of the Canadian Football League's list for an expansion franchise, but according to a new study five other markets could also sustain a pro football team. In a study called Playing in the Big Leagues, the Conference Board of Canada stated that Quebec City, London, Kitchener-Waterloo-Cambridge, Halifax and Moncton as well as Ottawa have the fundamental market conditions to support a franchise. The report took into consideration market size, income levels, corporate presence and the tax burden. The CFL has already granted a conditional expansion franchise to Ottawa, with the big hurdle being the renovation of Frank Clair Stadium. Work has begun to tear down sections of the old stadium, but it's not known when the work will be complete. When the yet-to-be-named team hits the field it will be Ottawa's third chance after the Rough Riders folded in 1996 and the Renegades shut their doors in 2006. Like Ottawa, none of the other five cities currently has a stadium suitable for the CFL. "Market conditions are fundamental to the viability of any professional sports franchise," Mario Lefebvre, director of the Centre for Municipal Studies at the Conference Board of Canada, said in a news release. "However, when considering future CFL franchises, new or significantly upgraded playing facilities and dedicated ownership are also crucial factors in the potential growth of the league." Quebec City and Moncton both have large football stadiums, but neither is big enough to host a CFL team. PEPS Stadium in Quebec City has a capacity of just over 12,000 permanent seats and would need to double that for a CFL team. Moncton Stadium has just 10,000 permanent seats, but has used temporary seating to attract more than 20,000 fans to two CFL regular-season games over the past two years. Although it wasn't in the report, it's believed teams need roughly 24,000 fans a game to break even. Both Halifax and Moncton would likely be unable to sustain a team just based on size of their own markets, according to the report, but Lefebvre believes they could be successful if they brand themselves as a team for the entire region. The challenges for the two Ontario markets on the list are the opposite. The proximity of London and Kitchener-Waterloo-Cambridge to Hamilton and Toronto means the cities are already indirectly served by the CFL. Indeed the two current Ontario franchises are the least ready to compete with new markets. Both the Tiger Cats and the Argonauts are near the bottom in league attendance figures. The Argos are in particularly rough shape, only cracking the 20,000 mark for four of nine regular season home dates this season. Although all eight teams currently have stable ownership, the newspaper said there are still issues with teams that need to be addressed. In addition to the attendance woes in Ontario, there are also ongoing debates about a new stadium for the Saskatchewan Roughriders. The league must also find a long-term solution to having two of its teams - the B.C. Lions and Argos - owned by the same person, David Braley.